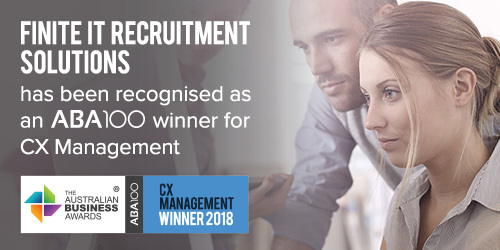 Finite IT Recruitment Solutions has been recognised as an ABA100 Winner for CX Management in The Australian Business Awards 2018. The Australian Business Award for CX Management recognises organisations that have achieved outstanding results through initiatives that demonstrate excellence in customer experience management. Finite IT Recruitment Solutions is a leading Technology, Digital and Business Transformation specialist recruiter across Australia & New Zealand. Founded by Managing Director Tracy Thomson in 1998, the business has grown rapidly through a mixture of organic growth and strategic acquisitions. It has nine ANZ offices, 90 internal staff, 1,150 external contractors and over 200 clients. The acquisition of a leading New Zealand IT recruitment business, NineTwenty, in 2016, strengthened its well-established market position across the Tasman. Finite’s high performing, motivated and highly valued staff, provide an exceptional customer experience, ensuring that they are the ‘recruiter of choice’ across an established and fast-growing client base. Finite recruits quality Digital, Technology and Business Transformation professionals for clients across a diverse range of industry sectors including: Banking and Financial Services; Telecommunications; Government – Local, State and Federal; ICT Vendors; Fast Moving Consumer Goods; Digital Media; Education; Health & Pharmaceutical; Transport; Energy Resources & Utilities; Not for Profit; and Supply Chain & Logistics. Finite’s core mission is to be the first people customers call for fast delivery of quality technology professionals. The business focuses on building solid client partnerships and providing service excellence. It offers clients the reassurance that comes with its network of candidates across the IT industry, alongside tailored and individual approach to each unique talent search. Finite takes the time to genuinely understand a client’s business, internal culture and technical environment to present only the most suitable candidates for each role. Nothing thrills Finite more than connecting great people.